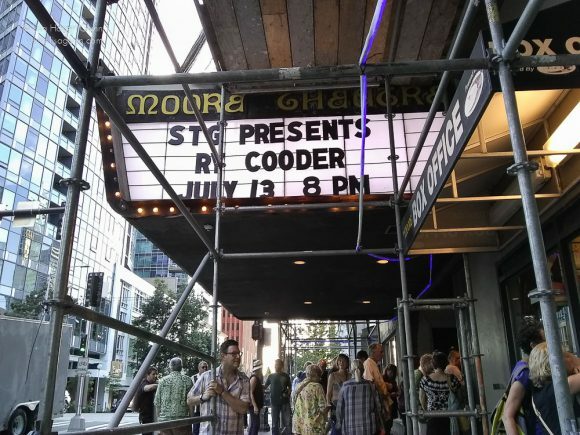 Renowned guitarist–vocalist Ry Cooder rarely tours these days, but he packed both balconies of Seattle’s Moore Theatre on July 13th. The living legend’s accolades include multiple Grammys, and his diverse credits range from blues slide guitar, to Buena Vista Social Club, to film soundtracks. Cooder’s latest album, The Prodigal Son, is strongly gospel-influenced with unabashed current-events commentary. Cooder opened with the Blind Willie Johnson classic, “Nobody’s Fault but Mine,” which showcased Cooder’s signature sound of warbling blues guitar and rich vocal vibrato. He then announced that he had, “Some tunes for you. Got some old ones, got some new ones.” True to his word, Cooder played a mix during the 15-song set. He then brought up his band—his son Joachim Cooder on drums, Sam Gendel on saxophones, and Robert Francis on electric bass—backed on vocals by The Hamiltones, a finely tuned gospel and R&B group out of North Carolina. They joined Cooder for all but two numbers. The crowd was seemingly full of admiring long-term fans familiar with Cooder’s music. A feminine voice screamed “I love you, Ry,” and a masculine voice added, “I do, too,” prompting cheering and applause. Cooder received two standing ovations. The audience was surprisingly compliant with the artist’s no-photo policy for the tour. Joachim Cooder opened the evening with a short set of “Because the Moonlight,” “Strange Love,” “Everyone Sleeps in the Light,” and “Fuchsia Machu Picchu.” The younger Cooder laid eccentric vocals atop live-sampled guitar, Array mbira, and brushed cajón. He was joined by experimental musician Sam Gendel on breathy effects-processed saxophone that was almost mistakable for organ. The duo built up tunes an element at a time, looping and layering into a plinky psychedelic rhythm. This entry was tagged lisa hagen glynn, ry cooder. Bookmark the permalink.